This prayer hangs beside the piano loaded with pictures of their family in the home of Gus and Anna Spitzmiller of Grand Lake, Colorado: It’s a good prayer, but hard to keep; for Gus, as the only plumber in Grand County, had his nose in everybody’s business who lived and prospered in middle Park. The story of this man, nicknames “Pipes”, is the story of change from the Olden Days to the Newfangled Ways of water in the house and a bath instead of a path? The reluctance of the pioneers to give in to change Gus could understand. Even he was caught between his love of his work and his love of the mighty mountains of Middle Park where he could fish and ride and prospect for gold and never miss the plumbing comforts by which he made a good living. Ten summers 1907-1917 he spent like a pale Indian in the high country around Grand Lake, returning to civilization and his pipes each fall to spend the winters following the advance of progress with his plumbing throughout the Midwest and Western states. Then Progress puffed over the Continental Divide with Dave Moffat’s Denver and Salt Lake Railroad, and “Pipes” Spitzmiller finally cast his lot with Lady Luck in Middle Park for half a century and four years, this has been his home and he loves it. Today Gus, 77 this April 23, is one of Grand Lake’s most colorful story tellers and beloved by summer folks who count that day well spent when they can “get Gus started spinning yarns” on the bench by the Village postoffice. And if they are somewhat embroidered, so what. They make mighty fine listening! Born in 1884 of German parents who came to Cincinnati, Ohio in 1880, Gus grew up expecting to follow the family trade of stone-cutting. But progress in the form of cement ruined the stone-cutting business in Ohio (if not in German’s Black Forest whence they came) so young Gus apprenticed as a plumber at the age of 15. But how did you get from Cincinnati, Ohio to Middle Park, I queried. It seems that Gus decided to stop over in Denver and visit his Aunt Victoria Richter for a few days before heading on to Frisco. But he fell in love with the mountains and the climate, so he got himself a job of plumbing in the old Sims Building on 15th and Champa. And that is just what he did. Giving up his plumbing job in Denver in the spring of 1907, “Pipes” boarded the train with Fred Mowbry and headed for the hills that were to become his home. Tom Johnson met them at Granby with team and wagon. They drove to Grand Lake and later from there to Squeaky Bob Wheeler’s Ranch up the North Fork of the Colorado, the present Phantom Valley Ranch now absorbed by the Park Service. “I had two jobs that summer. I had signed up to do 20 feet of mine assessment work for the Baker Brooks Livestock Co. at $10 a foot. That meant $200 for a summer’s work, dam good pay. Then I got $2 a month and board and room for wrangling horses for Squeaky Bob. “And between us we’d managed to put on a pretty good show for them. I wasn’t too smart about horse wranglin’ but I loved it; so I’d tie a ribbon on every nag and then a ribbon to match on his saddle, so I wouldn’t get mixed up. Squeaky got 50 cents a night for graining and wranglin’ the horses, and that was my job. “I put bells on some of them, but those dam horses were smarter than I was, and they’d stand perfectly still in the willows and let me ride on by, I’d go back to Squeaky and tell him the horses had got out and then’s when the fun would begin. “Squeaky would whip out his 6 shooter, a big 45, and fire straight in the air. That brought all the dudes up out of bed a running. He’d wave that 6 shooter at me and cuss, “You’re a goddam liar. You get those dam horses in here in ten minutes or I’ll fill you full of lead.” And I wasn’t too sure he wouldn’t do it! “Such was life at the first dude ranch in Grand County! But tell me about your mine, I prodded. “Oh, it was a good mine, a dam good mine, only it didn’t have any gold in it. “Course, I wouldn’t have known gold if I saw it, and I was too lazy to dig much when the fishin’ was good, but it was a good mine. Two summers Gus spent thus, then in 1909 he and three buddies hired a horse and wagon and a driver for $2 a day and they drove up over Berthoud Pass to Middle Park. Gus continued. That winter when Gus returned to civilization he persuaded his parents to buy up his relinquishment and move to Middle Park which they did in the summer of 1910. They raised a marvelous garden of root vegetables and head lettuce, when the porcupines would let them. Now this land, the North Shore development, is probably worth a hundred times $100. The next winter, 1911, Lady Luck led Gus to Des Moines, Iowa to pursue his plumbing exploits. And there, at his boarding house, he met a dainty but ambitious little Swedish gal by the name of Anna Victoria Sandstrom, recently arrived from the Old Country. Hospitalized from an appendectomy after serving in the household of the governor of Iowa for a year, Anna Sandstron was staying with friends, the Levines, when “Pipes” Spitzmiller put in an appearance. Romance immediately raised its pretty head but flourished slowly, for it took a determined Dutchman 6 years to woo and win the prettily stubborn Swedish lass Anna. In Denver on August 28, 1917, Gus and Anna were married and moved to Fort Lyon, old Bent’s Fort, where Gus was employed as a civilian charged with plumbing, and where they lived four years. There were born three of their four children, Irving, Gordon, and Barbara. Irving is presently working for Squibb Co., in medical research in N. J. and Barbara is a Lt. Cmdr in the Navy Nursing Service at Great Lakes, IL. 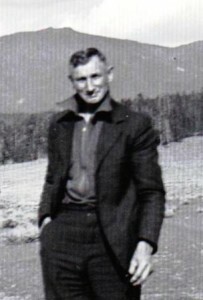 Gustave Eugene, better known as Bud by the Grand Lake folks whom he serves as town engineer at the sewage disposal plant, and TV tower, was born in 1923 at Grand Lake in the new home which Gus built here for his Anna on the foundations of the pioneer Cohen and Williams store. Now with a home and a wife and family of four, Pipes Spitzmiller set out in earnest to be the proficient plumber he was trained to be – but this time he stayed and worked in all of Middle Park, Grand Lake Lodge, in Rocky Mt National Park, decided to put in plumbing and Gus was elected for the job. All over Grand County, progress spelled Plumbing was in demand and Pipes traveled the length and breadth of the 75 mile square county putting bathrooms in the new homes of ranchers Taussig, Noonen, DeBerard, Hinman, Ennis, McElroy, Smith, Stafford, among others. Then in 1923 the biggest project of his life was undertaken and nursed for 35 years. He formed and installed the Grand Lake Water Co., System, only recently replaced by the new system which affords winter as well as summer water for the famous resort community. Now Gus has retired but his plumbing business has been carried on by his second son Gordon who makes a thing of beauty as well as efficiency out of the maze of pipes unseen by the owners whom he serves. Gus putters about the cabins which his Anna and Bud maintain for summer vacationists, and takes wonderful care of the birds in winter when heavy snows blanket the ground. And Gus can tell them!